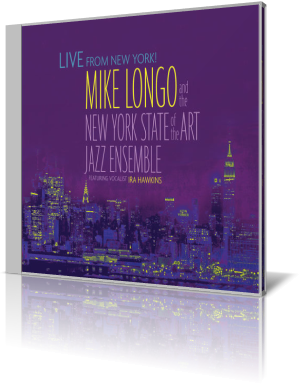 Mike Longo and the New York State of the Art Jazz Ensemble - Live from New York! The intense “Yoko Mama,” one of three Longo originals, is easily one of the more enjoyable songs. Solos are by Rogers, McIntyre (bass trombone) and Greene (alto). During each, Longo, Hubbard and Campenni get their grooves on. The centerpiece is McIntyre’s throaty grind. The trumpets come in during the latter part of Greene’s solo, setting the audience up for the full band. Rogers and Perowsky are featured on the closing track, “Wee.” It’s a high-energy piece that showcases the strength and beauty of a saxophone section playing the same notes, many of them in high-speed succession. The trumpets and trombones are also dynamic. Longo and Magnuson provide personal notes about the performance in the liner. Longo arranged all but one track. Longo spent several years in Dizzy Gillespie’s band. A native of Cincinnati, he began playing piano at the age of 3, thanks to his church organist mother and part-time jazz bassist father. After a move to Florida, 15-year-old Longo began working with his dad’s band on weekends and eventually was heard by Julian “Cannonball” Adderley. He later earned a bachelor of music degree in classical piano at Western Kentucky State University. Longo’s stage and studio associations include Gene Krupa, Nancy Wilson, Joe Williams, Zoot Sims, Astrud Gilberto, Buddy Rich and others. Live from New York! is the third release by Longo and New York State of the Art Jazz Ensemble.